So I noticed a post on Google's Recommended this evening. At The Big Questions they discuss a graph put forward by the AFL-CIO (largest union in the nation) in support of the Paycheck Fairness Act. This proposed law is meant to help close the gap between men and women in the workplace, so that they are paid an equal amount. Here's a chart of wage trends. Yeah, take a close look at the right side of the graph. The AFL-CIO flipped the axis when they made the graph so that it looks like the trend is the opposite of what it actually has been. A seriously classy maneuver, guys. So I was curious about the actual bill, of which I have heard little. It makes sense that there's not a lot of noise from the Dems about union pet issues lately: it seems like health care just about wrung the party dry as far, as many top officials are concerned, and they passed the Lily Ledbetter Fair Pay Act just this past year. I wanted to take a look at this new bill myself. I look at the AFL-CIO blog post about it, with the incredibly dishonest graph. Huh, funny, there's no link to the bill. But there's a link to more info about the bill. So I click on it, and it takes me to another AFL-CIO post. But there's still no link to the bill. Seriously, guys? Maybe some of us want to read it for ourselves, how about making it easy on us? But whatever. I follow yet another link to a site dedicated just to the act, the National Committee on Pay Equity's site. But... no, still nothing. No link to the bill. This is surprising, because it's really astoundingly easy to link to legislation in progress. The government has a great site up, THOMAS. But all the Committee has up is a link to their "fact sheet" on the matter (pdf) which is a useless bit of fluff that's full of info about how much $10,000 can buy and average wage gap info - nothing at all about common arguments against these sorts of bills. Let me mention that it's weird to hear about this initiative at a time when the news has announced that the wage gap is at a record low and still dropping (um, thank you recession... I guess). 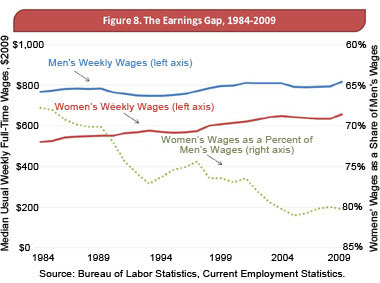 But regardless of recent politics and trends, the wage gap is still very real. Anyway, I finally found the bill myself. You can read it here if you're interested. I'm not much of a fan, although who knows how much of that is due to feeling I've been purposefully misled and avoided by a major proponent?